The National Science Foundation (NSF) recently announced the winners of the 2017 Graduate Research Fellowship Program (GRFP), with 15 current Notre Dame students, affiliates and alumni winning the prestigious award and another 18 earning honorable mention. Among this decorated cohort are two current College of Science students whose research focuses are stem cell biology and regenerative medicine, and neuroregeneration. Senior Bradley Bowles is a biology major in the College of Science. 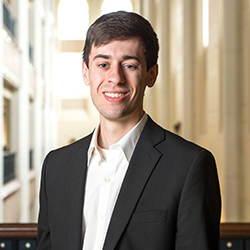 After receiving his undergraduate degree, Bowles will pursue a graduate degree in clinical and translational science. He hopes to "take basic research in regenerative medicine or stem cell biology and translate this into new therapies." "Studying biology gives me a chance to do incredibly cool things. For example, most of my undergraduate research has focused on growing blood vessels in tiny, silicone-based 'microfluidic devices' that almost resemble computer chips," Bowles said. "The best part about studying things like this is that I can apply this work to curing diseases and helping other people. In short, biology lets me do the science that I love while having the fulfillment of knowing that my work could benefit those in need." First-year Ph.D. student James Hentig conducts research in David Hyde's lab on neuroregeneration following traumatic brain injuries. Using zebrafish, which have remarkable regenerative capabilities, Hentig hopes to develop a traumatic brain injury model and see how and if the brain of a zebrafish regenerates following blunt force trauma. "I love neuroscience because the brain is the center of individual existence," Hentig said. "Furthering our knowledge and working towards regenerative therapies for individuals suffering from neurodegenerative diseases provides hope for not only the individual, but also for the families watching their loved ones slip in and out day by day." Nicholas Ames; anthropology, Ph.D. expected 2020. Bradley Bowles; biology, class of 2017. Julia Butterfield; mechanical engineering, class of 2017. Salvatore Curasi; biology, Ph.D. expected 2020. Paulina Eberts; chemical engineering, class of 2017. James “Jayme” Hentig; biology, Ph.D. expected 2021. Michael Hunckler; biomechanical engineering, B.S./M.S. class of 2016. Sreeraahul Kancherla; mathematics and economics, class of 2017. Jordan Lewis; biology and environmental science, SROP 2016. Brandy Sky Martinez; clinical psychology, Ph.D. expected 2021. William McCormack; physics, class of 2015. Sasha Padilla; biochemistry, Ph.D. expected 2021. Colleen Riordan; biochemistry, class of 2016. Claire Scott-Bacon; psychology, SROP 2016. Zoe Volenec; environmental science and economics, class of 2016. Paige Ambord; sociology, Ph.D. expected 2020. Clayton Becker; biology, class of 2017. Brooke Chambers (Weaver); biology, Ph.D. expected 2020. Joe Chambers; biology, Ph.D. expected 2020. Sophia Chau; environmental sciences, class of 2017. Mauna Dasari; biology, Ph.D. expected 2020. Paul Friesen; political science, Ph.D. expected 2021. Samuel Leung; chemical engineering, class of 2015. Luke Pardue; economics, class of 2014. Samantha Piekos; biology, class of 2015. Andrew Piper; physics, class of 2015. Vincenzo Pizzuti; chemical engineering, class of 2016. Alexa Rakoski; physics, class of 2015. Bolded names are individuals who previously or currently are pursuing research in the Center for Stem Cells and Regenerative Medicine laboratories. Adapted from an original publication by Cliff Djajapranata at science.nd.edu on April 21, 2017.